I had the opportunity to travel with one of Magna-Power’s technicians for the commissioning of a massive 1,500,000 watt programmable power supply system at the Department of Energy’s National Renewable Energy Laboratory (NREL) in Golden, Colorado. 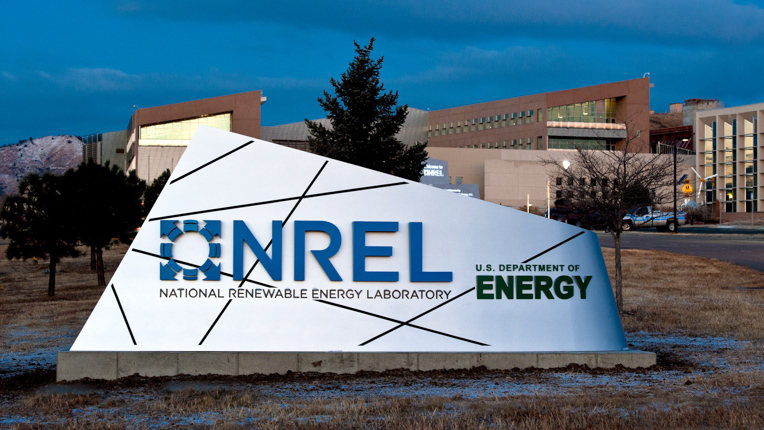 NREL is the leading United States facility for renewable energy research and development. 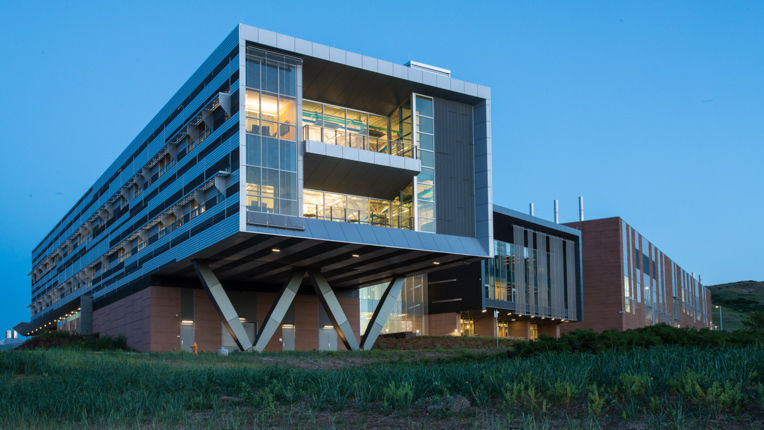 The Energy Systems Integration Facility (ESIF) at NREL, where the 1.5 MW Magna-Power system is located, provides a test-bed for a clean, renewable and intelligent US energy infrastructure. Figure 1. Entrance to the Department of Energy's National Renewable Energy Laboratory in Golden, CO. 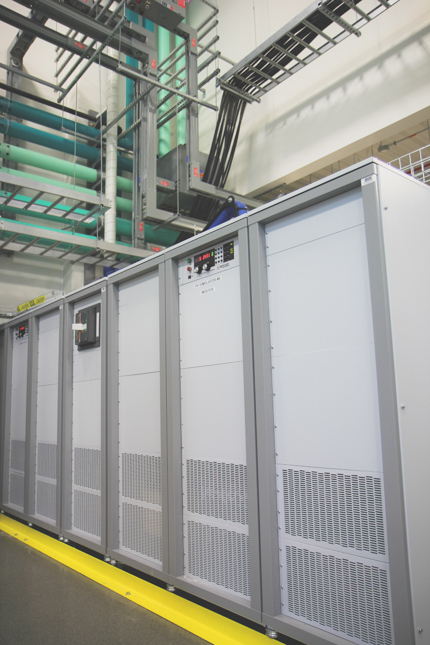 The Magna-Power system at NREL is comprised of six MTD1000-250/480+HS+ISO+LXI power supplies, which can be configured for either master-slave series or parallel operation with Magna-Power’s UID47 interconnecting device. Each MTD1000-250/480+HS+ISO+LXI power supply module is capable of 0-1000 Vdc and 0-250 Adc, continuously. With the +ISO option, each unit has a DC output isolation rating of ± 4000 Vdc, allowing the modules to be configured up to 4000 Vdc in series. With six modules, a variety of series and parallel configurations can be achieve. Like all of Magna-Power’s products, this system can be used as a standard constant current, constant voltage power supply or PV emulator. As a PV emulator, this system is used for testing and evaluation of new technologies and commercial products. I had a chance to sit down with Mariko Shirazi, an Electrical Engineer instrumental in the PV simulator selection process, to discuss more about ESIF’s activities and application of Magna-Power’s MT Series programmable DC power supply. Figure 2. The Energy Systems Integration Facility (ESIF) at the National Renewable Energy Laboratory. Interview with Mariko Shirazi, Ph.D.
What is the mission of the National Renewable Energy Laboratory, and in particular, the Energy Systems Integration Facility (ESIF)? The overall goal of this facility to test energy systems including electrical, thermal and fuel, and to provide a platform that integrates all these systems into a unified test bed. How are programmable DC power supplies used in order to achieve this goal? Programmable DC power supplies are used as photovoltaic (PV) simulators. One of the great attractions of ESIF is that we have the capability to test commercial and utility scale (i.e. 100 kW, 1 MW, etc.) PV inverters here. We have a 1 MW AC grid simulator that allows us to impose abnormal voltage and frequency conditions on to the PV inverter to see how it responds, which is not a common capability of a public testing facility. As a result, inverter manufacturers are interested in bringing their inverters here to test. In conjunction with the AC grid simulator connection, we also need DC PV simulation capability. Since we don’t have 1 MW PV arrays available, we need the ability to generate that input. And also, even if we had an array available, PV simulators are nice because they can produce repeatable results and are not dependent on ambient conditions. Programmable DC power supplies which are bidirectional can also be used to simulate a battery bank. If we want to test a large UPS inverter or other battery connected inverter, we may not have a battery of that size on hand but could still test the inverter with a battery simulator. When did NREL’s PV simulator system go online and begin testing inverters? We had a readiness verification in April 2013 we began testing inverters in May 2013. From the PV simulation side, we started with 1 MW of Magna-Power. What were some of the key selection factors when you were evaluating various types of power supplies and PV emulators at this scale? Power and voltage ratings. Bandwidth. Cost. Isolation voltage rating. Bi-directionality. Modularity. External analog inputs and type (voltage/current vs. irradiance/temperature, each has its own advantages depending on application). Software sophistication. Number of emulated points on a PV curve. Interpolation between successive curves. How fast the PV simulator could update curves. Ability to simulate multi-diode/multi-hump curves. What are some of the key features of the Photovoltaic Power Profile Emulation (PPPE) software that have simplified your testing? We like the ability to either manually enter an array or enter an array by maximum power point, open-circuit voltage and short-circuit parameters. We have not yet used the provided detailed model, where you enter temperature and irradiance, but we definitely like the other two modes. Figure 3. Multiple Magna-Power 250 kW MT Series power supplies at NREL used for solar array emulation. What about your application demanded High Isolation (+ISO) option? We want to run at ± 2000 Vdc, either floating or grounded, so there is definitely a possibility we could float above the standard configuration’s output isolation. We absolutely wanted the highest output isolation voltage available; this was also a deciding factor. Greg [another Electrical Engineer at ESIF] says he wants to have the biggest Magna-Power PV simulator in the world. [Laughs] How big is the biggest? Do you plan to leverage the analog-digital I/O for your own controller? Yes, we already have. We used a real-time Opal-RT system using our own PV model for simulation. I was pretty surprised it worked as well as it did because we were only running a 5 kW inverter with this huge supply. What integrated features in the Magna-Power system ensured safety in this application? Definitely the emergency stop input [Interlock]—critical. The Magna-Power system is built using 250 kW modules. Are you using this modularity at all for reconfiguration of the system? Modularity was key because we may want to test one 1.5 MW inverter, three different 500 kW inverters, six 250 kW inverters. You can imagine because as Energy Systems Integration Facility, we want to test single source equipment, but also what is the effect of multiple source equipment on the platform. Mariko Shirazi currently serves as the Lead REDB Engineer for the NREL’s Energy Systems Integration Facility (ESIF). The REDB (Research Electrical Distribution Bus) is the backbone of the ESIF’s electrical system testing infrastructure. In her role as Lead REDB Engineer, Mari is responsible for ensuring the continued relevance, performance, and safe operation of critical research electrical equipment connected to the REDB. On the Research side, Mari focuses on power electronics and microgrid controls development. Mari received a B.S. in Mechanical Engineering from the University of Alaska, Fairbanks, and a Masters and Ph.D. in Electrical Engineering from the University of Colorado at Boulder.